Ghosts, spectres, monsters, ghouls, bloody murders, evil spirits, devils small and large, and things that go bump in the night! We all have an underlying need to be frightened at times! Not in the real way but by means of imagination. And what better way than to let the book to the trick! Dictionnaire Infernal, ou Bibliotéque Universelle Magic. The most sought after edition of this well known magic dictionary. The rare illustrated 6th edition. A scarce two volume edition of the famous occult work. Chez Madame V Lepetit Libr. Another of C De Plancy's many works on the topic. An Historical...Treatise Of Spirits, Apparitions....1705. Satans Invisible World Discovered 1684. The first edition of the most famous Gothic novel ever published. The second edition with altered ending! A great collection of German Gothic Tales. A massive collection of Gothic Tales. One of the truly great firsts. Frankenstein, or the Man and the Monster, a Melodrama 1826. The complete dialouge with stage directions and costumes, the only edition correctly marked, by permission from the Promter´s Book. Original poster for a 1827 Theatrical perfomance in London. Engraving from a 1851 staging of Frankenstein. Blockes-Berges Verrichtung...ingleichen von der Hexenfarthund Zaber-Sabbathe M Johanne Praeterius Leipzig 1669. Massive text on witches and the witch-sabbat. The history of the Salem Trials. An Historical Essay Concerning Witchcraft 1718. A Discourse Of The Damned Art Of Witchcraft 1613. More Wonders Of The Invisible World 1700. The Salem trials and more. Letters On Demonology and Witchcraft 1830. The Astrologer of the Nineteenth Century 1825. A fascinating book on astrology. Handcoloured frontisp and title-page, plus several full-page plates and illustrations in text. Large folding frontisp showing The Mystical Wheel of Pythagoras. A Manual Of Astrology or The Book Of Stars London 1837. The Magus or The Celestial Messenger 1801. The History Of The Devil 1814. DeFoes history of the Devil. A very comprehensive text on the subject. The Book of Werewolves 1865. A very scarce text on the legends of werewolves, the first book on the subject published in English. Elliot O´Donnell's book on the topic. The wild beast of Gévaudan. A 1754 engraving of a Werewolve roaming the streets of Paris! A very scarse treatise on the topic. A very scarse german book on Werewolfes. Ghost stories Collected From True Life. The Terrific Register, or, Record of Crimes.. 1825. Over 1600 pages of horror, monsters and murders! Each story with a front engraving. Includes stories such as The Vampire Of London, The Haunted Bedroom, The Price of Blood, etc, etc. The Casket. 2 vol. London 1828-30. 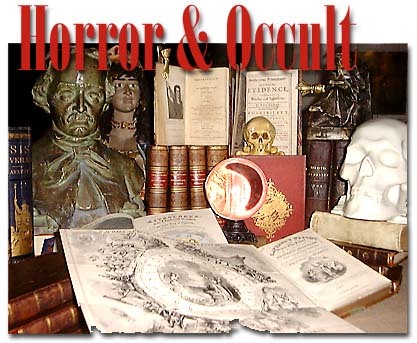 Listing 6707 books in on the Occult! Stanislas De Guaita et sa Bibliotheque Occulte. Bloods - 19th C Working Class Fiction. Important cataloge of Penny Dreadfuls. The Hour of One. Six Gothic Melodramas. Contains original texts but also some important information on gothic stories on the stage. Stephen Wischhusen, Gordon Fraser, London 1975. All sorts of aspects on the beastie, with extensive notes on sources. Huge catalogue containing endless amounts of bibliographic information on books about all sorts of things occult, secret societies, etc. [Facsimile print]; C. Coulet & A. Faure, 1988. Contains novels and short stories; includes plot summaries, and author, title and motif indexes. Gothic. 400 Years of Excess, Horror, Evil and Ruin. Richard Davenport-Hines, Fourth Estate (London) 1998. Bibliothèque Occulte. Stanislas de Guaita et sa Bibliothèque Occulte. Full bibliography of the wonderful library of one of the most famous "wizards" of the late nineteenth century. [Facsimile print] Librairie Dorbon "1899" - in fact, 1980. The Publication of The Monk. A Literary Event 1796-1798. André Parreaux, Librairée Marcel Didier (Paris) 1960. He might have been just slightly wrong on the odd occasion, but of course this book remains the bibliography. The Gothic Quest. A History of the Gothic Novel. Rambling companion volume to the above. Montague Summers, The Fortune Press (London) n.d. (1938). Extremely useful if/when you forget which book is about what. Ann B. Tracy, The University Press of Kentucky, 1981. Classic overview of the history of gothic literature. The Scarecrow Press (London) 1987.